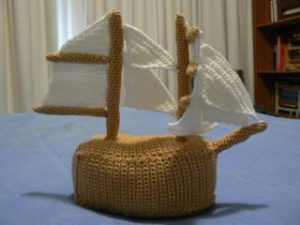 I designed a crochet model of a tall ship. The sail plan is almost identical to the sail plan for the Young Endeavour. I left out the fisherman staysail because it is almost never used anyway. The finished model is 30 cm long. The pattern is written in American crochet notation. 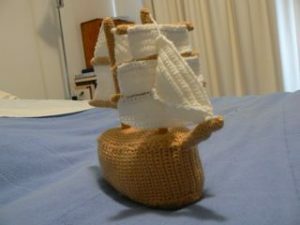 You will need a 3 mm hook and a 2 mm hook and 8 ply brown and white wool. Bamboo kebab sticks will also come in handy because turns out crochet doesn’t have much structural integrity. This is essentially a cross-section of a ship at the waterline. Or at least how I imagine the cross-section is. I don’t really know much about ships, as you are about to find out. We will start at the stern (back) and end at the bow (front/point bit). Fasten off, weaving in the ends. I thought that this would be bigger than the hull at the waterline, but upon careful study of my dad’s ‘Fighting Sail’ book I think that the hull actually bulged to its widest point at the waterline and the deck was smaller. Sew the keel, deck and hull together to form the body of the ship and stuff. I’m not sure how to explain this better other than to say the keel is down the bottom, the deck is up the top and the hull is the strip that joins them. The kinks in the hull that are formed by the backloop only rows should be aligned with the corners of the keel and deck. Shove in a kebab stick and stuff. Sew it to the bow, I found it very helpful to shove the remainder of the kebab stick right into the body of the ship to keep the bowsprit steady. You will be attaching the jib and forestaysail to it later so you want it to be strong. Stuff and shove in a wooden kebab skewer. Stab the remaining bits of the kebab skewer for each mast into the ship and sew them down. There is a mast at the front (the foremast) and a mast at the back (the mainmast). Fasten off, sew up the hole. Shove a bit of the kebab skewer into the mainmast to stabilise it when you sew it on. Sew on the yardarms. You’ll probably want to refer to the photos of the ship to see where they go. I also recommend going to the Young Endeavour’s website and looking at the diagram of its sail plan. Sew the top of the sail to the topgallant yard. Sew the bottom corners to the topsail yard. Sew the top of the sail to the topsail yard. Sew the bottom corners to the course yard. Sew the top of the sail to the course yard. Sew the sail to the top of the boom, the mainmast and the bottom of the top yardarm on the mainmast. 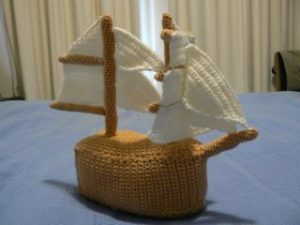 Sew the sail to the top of the top yardarm on the mainmast and the mainmast. The right angle of the triangle should be at the bottom, near the mainmast. Attach one corner just above where the top yardarm on the mainmast meets the mainmast. Attach the other corner half way between where the course yard attaches to the foremast and the deck. The right angle of the triangle should be at the bottom, near the mainmast. Attach one corner just below the top of the mainmast. Attach the other corner where the topsail yard meets the foremast. The right angle of the triangle should be at the bottom, near the foremast. Attach one corner to the top of the foremast. Attach the other corner to the end of the bowsprit. The right angle of the triangle should be at the bottom, near the foremast. Attach one corner to the topsail yard. Attach a little bit back from the end of the bowsprit.